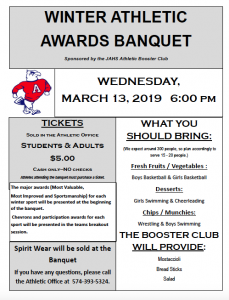 The Winter Athletic Sports Banquet is scheduled for Wednesday March 13, 2019 in the John Adams Cafeteria at 6:00 PM. The banquet is sponsored by the John Adams Athletic Booster Club. Awards for all of the 2018-2019 Winter Sports, Kiwanis Award, and Academic All Conference will be awarded at the banquet. The cost of tickets is $5.00 for Adults and Students. Tickets can be purchased in the Athletic Office before the banquet. The Booster Club will be providing dinner but all families are asked to bring a side dish. Boys and Girls Basketball are asked to bring Fruits/Vegetables, Girls Swimming and Cheerleading Desserts, and Wrestling and Boys Swimming Chips/Munchies. The Booster Club will also be selling spirit wear at the event as well.